A candied layer of walnuts is broiled on top of this creamy pumpkin pie for an elegant version of this traditional holiday dessert. Sort of a pumpkin pie brûlée for the pilgrim set! Combine walnuts and brown sugar in small bowl. 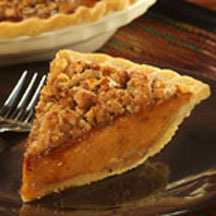 Place 3/4 cup of nut-sugar mixture on bottom of pie shell. Combine pumpkin, evaporated milk, sugar, eggs, pumpkin pie spice and salt in medium bowl; mix well. Pour batter over nuts. Bake for 15 minutes. Reduce temperature to 350°F (175°C); bake for 40 to 50 minutes or until knife inserted near center comes out clean. Cool on wire rack.